Choosing a design school that is right for you is not an easy task. It involves a long-term commitment and the education you will get must be up to your expectations. It is normal to hesitate. Here are 6 reasons why you should choose Strate. Thanks to the quality of its work in the fields of pedagogy, research, social policy, administration and management, Strate School of Design was officially recognized by the French State. The Strate’s Design Program is a graduate degree recognized by the French State called “Titre de Designer Industriel RNCP Niveau 1”. The school is located right next to Paris within green and lush surroundings. Its building covers 3000m2 and includes all the equipment dedicated to learning design: a 200-seat amphitheater, 17 classrooms, 5 computer labs and 6 workshops including a digital workshop. Strate’s team is dedicated to its students and their success. This why the school fosters a creative and studious atmosphere. The student office is an active body of the institution and organizes activities. Strate School of Design was founded in 1993, and its Alumni network has grown to include more than 1,400 members. Some of whom are currently decision-makers in large companies. 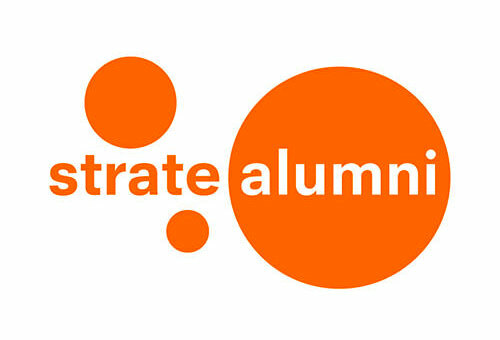 Strate Alumni is an Alumni association made up of all graduates of Strate School of Design, as well as Strate’s students. Its mission is to represent and federate the "Stratos", support their professional development, support the school in its actions for the Stratos, and promote design and innovation through design in society. Since its foundation the school has had internationally-oriented policies by developing exchanges, internships and relations with other schools and companies. Strate is part of "World Design Organization", an international association whose purpose is to protect and promote the interests of the profession of industrial designers. Design centers, professionals and schools from some fifty countries meet regularly to discuss practices, issues and propose joint actions. Strate is also part of Cumulus, an association of more than 250 schools of Art and Design in the world. The school gives its students the opportunity to do a semester abroad in a partner design school or do an internship. Since 1993, Strate has developed relationships with design professionals and large companies. Today, many professional partners offer us partnerships, take trainees and hire our designers. Finally, all of our teachers are active professionals. Also all of our programs include mandatory internships. Strate takes part in several multidisciplinary projects aimed at putting our students in innovation groups combining their skills as design students with students from engineering and business schools. Our students meet those of Centrale Supelec, Essec, Arts and Crafts Paristech, Institut Telecom Paristech, etc. Strate developed a double degree with Grenoble Ecole de Management. By studying an additional year, our students can obtain a Designer - Manager double degree.